It’s been over a year since the scaling upgrade known as segregated witness, or SegWit, was activated on the bitcoin network. Even so, only an estimated 36 percent of all bitcoin transactions are actually using it. Why the minimal adoption rate? It’s largely because, like any backward-compatible upgrade (otherwise called a soft fork), SegWit ensures participants in the bitcoin network that haven’t upgraded to the same software can still follow the same network only under a slightly less-restricted ruleset. As a result, some bitcoin businesses and exchanges have put off making the switch to enable SegWit transactions despite the low-fee advantage that it presents when sending bitcoin payments. Still, both Russell and Aaron Lasher, the chief strategy officer at bitcoin wallet company BRD, suspect that pressure for SegWit adoption will increase for businesses in the event of a bitcoin price increase. Lasher conceded that it was no easy feat to change backend code to recognize, send and receive SegWit transactions. While not yet released for bitcoin, Winklevoss promised migration to the new wallet system in Q1 of this year. And the sooner the better in Russell’s point of view who advises businesses and exchanges to think proactively. “Frankly, at some point when fees do go up if there are businesses that do not support segwit, people screaming about fees will obviously take their business somewhere else to someone who has done the work [to support segwit],” said Russell to CoinDesk. Approaching the release of SegWit back in August 2017, fundamental disagreements created competing parties that envisioned divergent use cases for the world’s first cryptocurrency. Indeed, since 2017, the segment of the bitcoin community that disapproved of SegWit has focused its efforts around an alternative cryptocurrency called bitcoin cash (now referenced on some exchanges as Bitcoin ABC and Bitcoin SV due to a recent chain split). While there are bitcoin mining firms that were formerly vocally opposed to SegWit activation – notably, hardware giant Bitmain – the financial incentives for miners to validate SegWit-enabled transactions are now difficult to ignore. With SegWit-enabled transactions making up nearly 40 percent of the bitcoin network, it means that transactions deliberately excluded for ideological reasons would reduce the total mining reward doled out to miners for validating a new block. But Steinberg agreed with Lasher that differences in opinion over SegWit are not primary factors currently dissuading SegWit adoption. AsicBoost, described as a “mathematical trick,” is a mining firmware that enables bitcoin miners to perform the computations necessary to create new blocks and verify transactions on the blockchain up to 20 percent faster than average speeds. The technology, patented by Bitcoin Core developer Timo Hanke and Sergio Demian Lerner in 2014, was recently made publicly available for all miners to use under the Blockchain Defensive Patent License. However, in order to use the firmware without license or detection, miners must deploy an alternative version of the technology called “covert AsicBoost” that is incompatible with SegWit for reasons to do with how SegWit payments are written and rearranged on blocks. As such, back in late October 2018, when bitcoin mining pool Antpool was seen to exclude SegWit-enabled transactions for a period of roughly one week, certain proponents of the bitcoin community harped back to old allegations against Bitmain – which operates Antpool – for secretly attempting to deploy the firmware. Calling that “a pretty good guess” as to what may have been going on, former Bitcoin Core developer and applied cryptography consultant Peter Todd said that, at the end of the day, nothing could be ascertained for certain. Steinberg contended that, in his view, using “any sort of innovation in the field is fair game” for a mining pool to deploy given the decentralized nature of bitcoin and the technology as a whole. But given the ever-increasing number of SegWit transactions, covert AsicBoost and other hardware-related innovations incompatible with SegWit are unlikely to remain advantageous for profit-driven miners. Seeing mass adoption of SegWit as a slow but inevitable reality, Blockstream developer Russell explained to CoinDesk that, in his view, technology proliferates “in 10- to 25-year cycles” making it “still very early” in the SegWit adoption game. In the letter, they pleaded with both business and users to prioritize SegWit-optimized services and “get SegWit to 100 percent” adoption. With SegWit affecting the weight of transactions, businesses and exchanges require upgrading software such that users are able to send and receive SegWit-enabled bitcoin transactions from a string of 26 to 35 alphanumeric characters. This can be done in two different ways. First, businesses can reuse an older upgrade that has been around since 2012 called the pay to script hash (P2SH). P2SH was originally a way to compress complicated payment conditions attached to bitcoin transactions but was later leveraged by developers to ensure interoperability between addresses that don’t support SegWit transactions and those that do. What Lasher calls the “better” version of SegWit is exclusively interoperable with those businesses and users that have upgraded their software to read a SegWit-exclusive address format created by Bitcoin Core developer Pieter Wuille and Blockstream CTO Greg Maxwell. That version is known as Bech32. Bech32 is a bit complicated. It’s currently “not recommended for use until more software supports the format,” according to Bitcoin Wiki. It’s a more difficult implementation of SegWit to enable. That said, Bech32 is actually more efficient than P2SH. 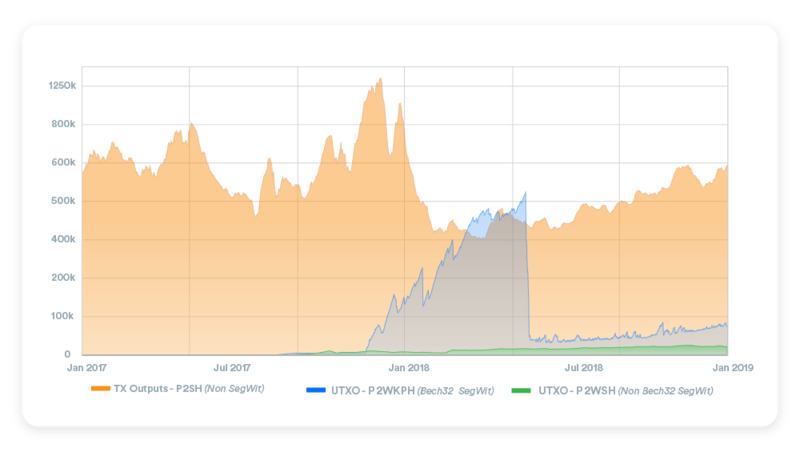 That’s because, unlike Bech32, which launched last February, P2SH is a repurposed upgrade from 2012 that was not natively engineered to support SegWit. As such, the later upgrade actually processes SegWit transactions in a more roundabout fashion than Bech32. And precisely for its backward-incompatibility, Lasher says the “initial tension” of switching over to Bech32 can be thought of as a positive force to further incentivize businesses and exchanges to upgrade their bitcoin software. Describing the process like learning a new “language” such as Greek, Lasher contended that “this incompatibility issue where everyone needs to learn how to speak Greek” remains one of the major reasons still hindering widespread SegWit adoption.